March 2nd is upon us and the 2014 Heritage Classic is finally here! After a hard-fought battle against Detroit on Thursday night resulted in a 6-1 loss, the Senators hit the road to Vancouver. I can confidently say that there has never been this much anticipation for a game of hockey played outdoors but also still indoors in the history of the NHL! 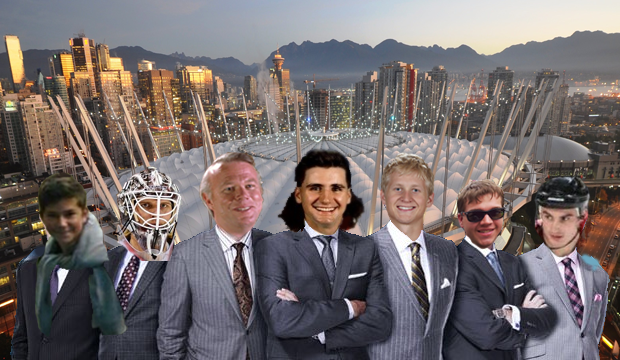 Thanks to corporate sponsors, the gang here at bonks mullet dot com was flown out to Vancouver to watch the action live. Rumours are suggesting that our corporate sponsor is Sun Media but we are denying those claims. To remember the simpler days of years past, Chris Neil and Chris Phillips headed out west being pulled by one of Eugene Melnyk's horses. Some expected the journey to take weeks give that Euge sent a horse named 'Random Useless Trotter'; Melnyk maintains, however, that the horse can trot around the largest parking lot in Eastern Ontario quicker than Erik Karlsson can break five very expensive sticks.That's fast! There were no blue lines to worry about so it was full speed ahead for Jockey Neil! Here in Canada, nothing says 'Heritage' quite like a lumberjack (ask the Ottawa REDBLACKS). Kyle Turris embraced the heritage this weekend in his native province of British Columbia! Turris also couldn't pass up the opportunity to take his famous dog Leo out for a nice walk. Laying the lumber like he's Johan Franzen. Finally, a lot has changed since 1915, but even so, the Senators of today and 100 years ago have more in common than you think. Take a look! There were no sneaky cameras to record Murray's in-game reactions back in the day. Thanks for reading and enjoy the game!